hackenslash: Give Us A Wave! Today I wish to talk about waves. No, not that kind of wave. I want to talk a bit about the mechanics of waves, and what it means for the universe. In a previous article, The Certainty of Uncertainty, we discussed some of the foundations of quantum mechanics, and the history of the battle between particles and waves. We concluded, of course, that neither the particle model nor the wave model was correct, but that both were manifestations of different behaviours of something more fundamental; fields. Here, we're going to explore some of the implications of wave behaviour and especially how they interfere with each other, and how this leads to some of the central features of quantum mechanics. I strongly recommend reading the earlier article, as this will build on some concepts discussed there. This promises to be about the most technical discussion you should encounter on this blog, although I don't intend to delve into all of wave mechanics, just enough to give a flavour of how the science works. I'm also going to be switching between sound and light so that I can make it as simple as possible to follow, and because I have a lot of musician friends, and some of them have noted that I haven't done anything about audio yet, despite promising to do so. For simplicity, I'm going to stick with sine waves, but what we'll discuss applies to all waves. 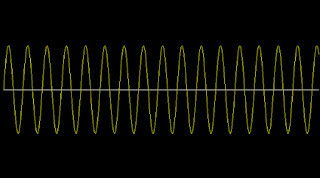 Here's a simple, single-cycle sine wave to get us started. All waves have three key features: Frequency, amplitude and phase. Frequency is measured in cycles per second, or Hertz (Hz), after German physicist Heinrich Hertz, who first demonstrated the existence of electromagnetic waves. In sound, frequency manifests as pitch. 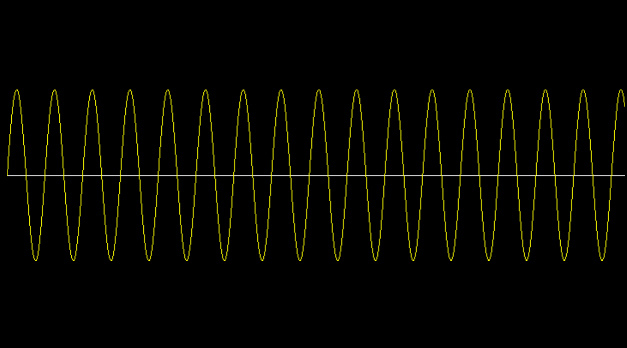 If we take this frame as representing one second of time, then the frequency of this wave is 1 Hz. If this were a sound wave, it would be well below the range of human hearing which approximately runs, optimally and prior to any age or damage related loss, from 20 Hz to 20 kHz (20,000 Hz). 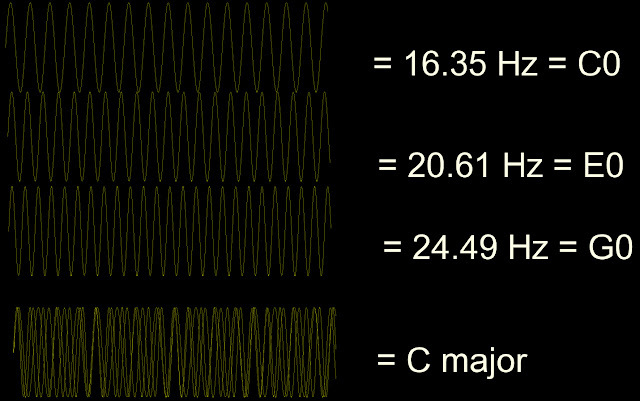 Here's another second of wave, where the frequency is now 16.35 Hz, which is the fundamental frequency of the lowest note (C) on a tuba or an imperial piano. On an instrument, this note would be made up of a fundamental and harmonics, the sum total of which make up the timbre of the instrument at a given note. The fundamental frequency would again be inaudible, and would thus be felt rather than heard. The harmonics, though, would tend to be audible. Amplitude is the height of the wave. In sound, this equates to level*. Thus the larger the amplitude, the louder the signal. In light, it would equate to intensity, or the number of photons. Finally, phase is where in the cycle the wave is at a given time. For individual waves, this mostly has no effect, but it has some interesting properties that will become clearer when we begin to look at what happens when multiple waves interfere with each other. An important concept in wave mechanics is known in the jargon as 'coherence'. Coherence deals generally with correlations between physical quantities in waves. In the most basic form, two waves are coherent if they're the same frequency and the phase relationship between them is constant. As discussed in the earlier article, where the peak of one wave and another wave meet, they are 'in phase' and they constructively interfere, which has the effect of increasing the amplitude. As we can see, if we take two waves of the same frequency and amplitude, in relative phase, the output is a wave of twice the amplitude. If we take three, we have triple the amplitude, and so on. Where the peak of one wave meets the trough of another wave, they are 'out of phase' (180°) and they destructively interfere, with the result being cancellation, or silence. For completeness, let's look at what happens when we put multiple waves of differing frequency together. Here are three fundamentals, 16.35 Hz, 20.61 Hz and 24.49 Hz respectively. This is the chord of C major. Unfortunately, you won't be able to hear this unless you have spectacular hearing, because all these are below or at the threshold of human sensitivity. Played loud enough, you'd certainly feel them. The last of those waveforms is the combination of the three waves for the chord. You'll note that there are some regularities in the meeting of the waves. This is how harmony works. Harmony is a function of correlation of phase at different frequencies. As we can readily see, doubling the frequency gives an octave above. This is true for all sound waves. What about frequencies that are closer together? Here we have two frequencies quite close together. Anybody who's used a tuning fork to tune a guitar will be familiar with what's happening here. As you tune the string and get closer and closer to the correct tuning, you begin to hear a tremolo pulse (many guitarists think that tremolo is what you achieve with a whammy bar, but this is incorrect; a whammy bar modulates pitch, thus it's actually vibrato, while tremolo is a modulation in amplitude) in the interplay between the string and the tuning fork, quickly at first, then slowing down as the notes get closer and closer together. You can see why with the wave, as that pulsing is a function of where the waves are meeting. Where they meet at the top, the pulse is at its loudest, then it cycles through the phase difference getting quieter and then louder until they meet at the top again. Once the string and the tuning fork are playing the same pitch, the phase will meet and the pulse will disappear. Incidentally, for those not of a musical bent, this is also what happens when somebody sings out of tune, and why it's so difficult for people with well-trained ears to enjoy shows like the X-Factor (and indeed a fair bit of popular music). Just as even untrained ears can appreciate harmony, very well-trained ears find the dissonance of out-of-tune singing quite unpleasant and even painful. As an aside, the above also gives some insight into how radio for broadcast works. The broadcast signal from the station is encoded in a carrier wave of a given frequency, which is modulated in a specific manner pertaining to the band. For AM radio, the amplitude is modulated. For FM, it's the frequency that's modulated. Your radio contains a 'demodulator' that removes the modulation, leaving the broadcast signal. As you can see from the diagram, the modulation matches the changing amplitude of the broadcast signal, and it's this that allows us to tune into particular signals in the morass of radio waves. So, now that that's out of the way, let's get back to the main topic. 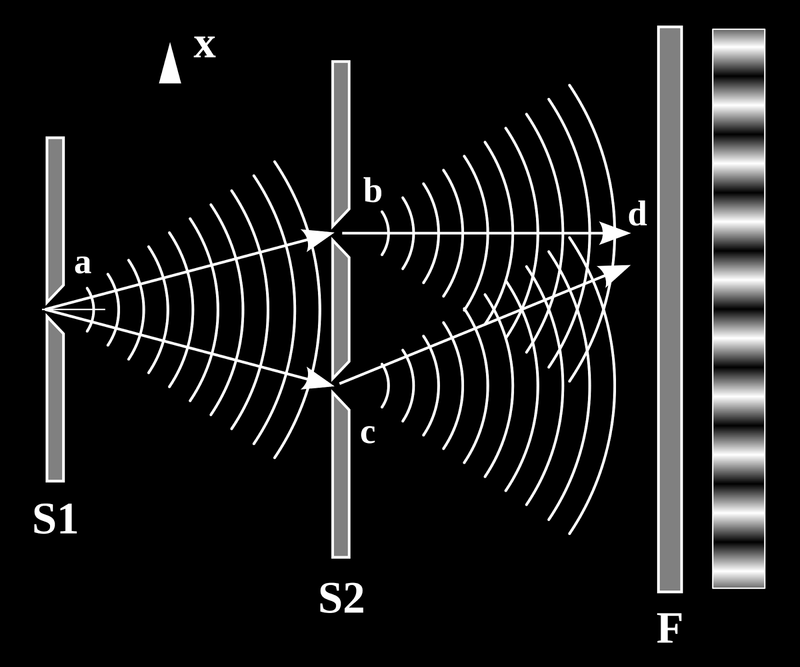 Photons have zero rest mass, but they do have some mass associated with their motion, which manifests as frequency. In electromagnetic terms, frequency manifests as colour. We think of colour as applying only to visible light, but that's a mistake. Just as there are sounds that are outside our hearing range, there is colour beyond our visual range. Light is simply the visible range of frequencies in the electromagnetic spectrum. There are those who advocate calling the entire spectrum light, and it's hard to argue against. In any event, because the frequency of a photon is a manifestation of its mass, we can say that this also correlates to the amount of energy in a given photon, which means that the colour of a photon denotes the amount of energy it's carrying. Another interesting thing about photons is that, unlike fermions (matter particles, loosely speaking), they're not subject to the Pauli Exclusion Principle. This principle prohibits fermions in the same quantum state to occupy the same place. Bosons are not subject to it, though, which means that we can concentrate photons into a very tight area. When we combine all of the above, we can begin to get an idea of how lasers work. We take lots of photons of a given colour, with their phase correlated, and concentrate them into a tight beam using curved mirrors. Because we're sending lots through at once, and because they're coherent, the energy of each photon adds to the amplitude of the output. This is why lasers have such energy. It's also why they can be controlled to have very little diffusion, so that they remain tightly focussed over a long range, because it mitigates diffusion as a result of wave interference. Here's a nice little diagram of the workings of a helium-neon laser, for those with mechanical leanings. So what does all this have to do with quantum theory? In The Certainty of Uncertainty, we talked about a series of experiments, the double-slit experiments performed by Thomas Young, the basic iteration of which is extremely simple. Taken as a whole, though, this series of experiments has led us to an understanding of the world that is really quite disturbing, and conclusions so profound that they make other allegedly profound ideas seem rather mundane in comparison. Further, this experiment has many variations, and it's a variation of this experiment, the laser interferometer, that is now giving us a brand new way of looking at the cosmos, and promises to shatter some of the observational barriers we've faced until now. On the left, we have a light source at a. In the centre, there's a screen with two slots cut into it. On the right, there's a photographic plate. As the light comes through the slits, the light propagates outwards in two arcs. Just beyond the slits, these arcs begin to overlap. On the far right is an illustration of what appears on the plate. Because of the details of overlap, the two wave arcs are interfering with each other, sometimes constructively, sometimes destructively, which is why we see the pattern of light bands where the amplitude is highest and dark bands where the waves have cancelled, exactly as discussed above in the context of sound waves. When Young first proposed this at the Royal Society in 1800, he wasn't taken very seriously, largely because Newton's 'corpuscular' (particulate) theory was widely accepted. However, Young had observed this phenomenon in water (you can get a similar effect if you drop two pebbles into a pond side-by-side where the concentric rings overlap), and was confident that the experiment would show waves. He eventually performed the experiment in 1803. Young was described in the title of a 2006 biography by Andrew Robinson as The Last Man Who Knew Everything. He really was a polymath, a medical doctor who made significant contributions to many areas of study, including physiology, solid mechanics, harmony, language, Egyptology (it was Young who noted the similarities between the Demotic script and the hieroglyphs on the Rosetta Stone, and that the hieroglyphs used phonetic spelling for foreign names) and others, and was professor of natural philosophy at the Royal Institution. I highly recommend Robinson's book, a beautifully-written and fitting tribute to one of the little-known greats of science. Ultimately, after a series of anonymous attack's in the Edinburgh Review caused a publisher to back out of publishing his work, Young left physics behind to concentrate on medicine. Anyway, the implication of the experiment is clear, and it seemed to nail shut the case for waves and overthrow Newton's particulate view. As discussed in the earlier article, there were other iterations of this test, and some interesting results came out of some versions of it. We discussed how Einstein, in his first paper of 1905, showed that it took a photon of a certain frequency (energy) to knock an electron of a metallic strip, the basis for solar energy. We covered the difference in outcome when we tried to extract certain information from the experiment, and the particulate implications, leaving us with the uncomfortable conclusion that both particle and wave were behaviours arising from our interactions, and that we were looking at something else. We also looked at polarisation, loosely the angle at which a quantum entity's wave-like component is waving, so now we've laid the groundwork, let's look at how all this ties together. We've already met two examples of macroscopic quantum systems that exhibit coherence, namely the laser and the interferometer. What we didn't discuss in either case is how the concept of interference enters quantum mechanics. 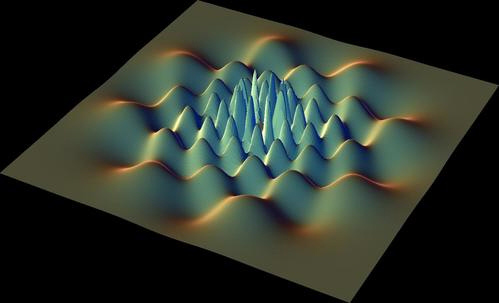 Because of its wave-like component, demonstrated by iterations of the double slit experiment in which a single particle is sent through at a time, any quantum entity can be modelled as waves, including the particulate component. An interesting consequence of this arises when we talk about the concept of 'superposition'. We call the wave component the 'wavefunction', generally denoted psi (Ψ). This wavefunction represents all the information we can obtain about how a quantum entity evolves all the time, specifically the probability that a particle will be found in a certain location when measured. For a free particle, the wavefunction is a sine wave, as we met above. There's something implicit in the above which may not be immediately obvious. We've been dancing around what the wave component of a quantum entity actually represents in terms of probability, but we now need to make explicit a difference in how probabilities work in general and quantum terms, and it's simply this: In QM, probabilities are manifest. They really happen. When we talk about the probability given by the wavefunction (actually, the square of the wavefunction), we're saying it's actually there, with that probability. 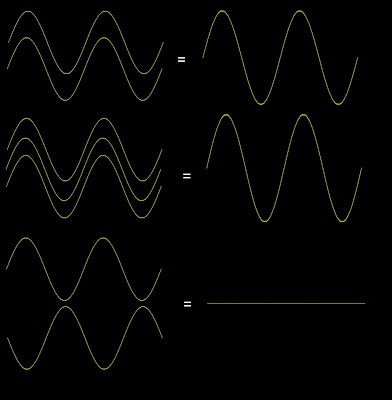 Let's look at a typical wavefunction and see what that might mean. Here's a graphic representation of the wavefunction of a single electron. 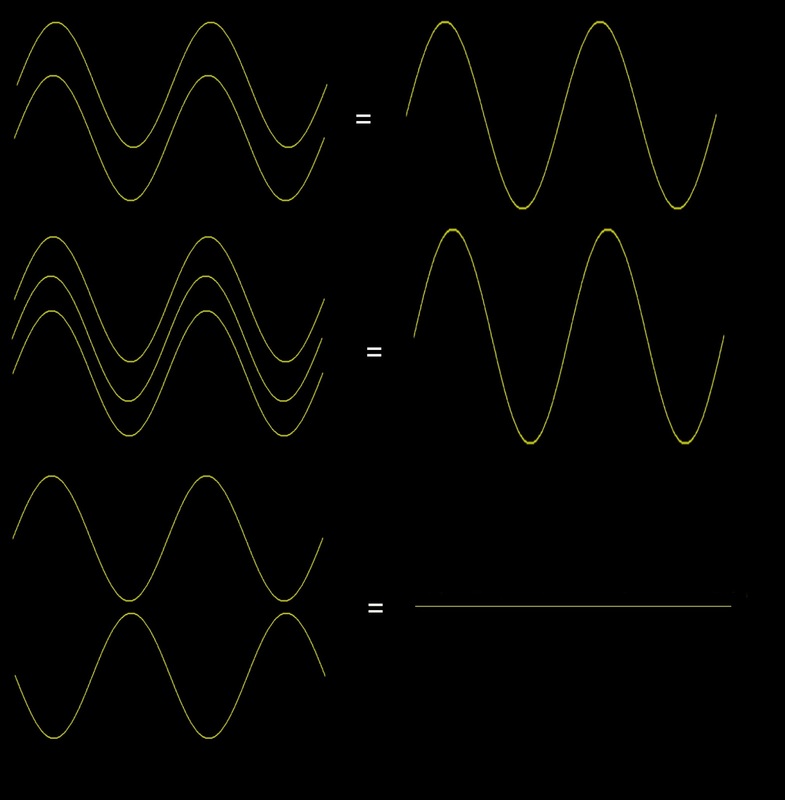 Each point in that wavefunction represents where the electron is, with a given probability. It exists in a superposition of all those places. In other words, the electron is in some sense literally there prior to measurement. As with all cases, a probability must fall somewhere between zero and one. Prior to measurement, all the probabilities described by the wavefunction sum to one, because the probability that the particle will be measured somewhere is precisely 1. When we measure or observe the particle, all probabilities other than the location at which we measure it fall to zero, and the probability at that location snaps to one. This is what's described in the jargon as 'wavefunction collapse'. This is how the disappearance of the interference pattern in the double-slit experiment is explained. When we observe the particle going through a given slit, we collapse the rest of the wavefunction, so that the behaviour that registers on the photographic plate reflects the particulate behaviour of the entity. In short, without observation, the wavefunction travels through both slits at the same time. With observation, the particle goes through the slit we observe it to be going through and the pattern we see is two bands, as we'd expect from particles. When we try to explain this, we're forced into the conclusion that a particle on its way to the screen in the double-slit experiment takes every possible path, including those that take it across the universe first. Luckily, because components of the wavefunction can interfere with each other, both destructively and constructively, the end result being that many of the lower-probability paths cancel each other out, while the higher-probability paths are amplified, so that we will tend to observe the higher probability paths at all times. I'd wanted, in this post, to also talk more in-depth about quantum coherence and decoherence, as well as some other aspects of QM, but I'm conscious of the fact that this is already a long read so I'll leave it there for now and pick those topics up in a future post. This has been a tricky topic to cover, and I have little doubt that I've made some errors on the way, so any feedback is welcomed, as always. *you might call it 'volume', but this is a misnomer, and a pet peeve of many audio professionals. This is a term used by hi-fi manufacturers, and stems from the idea that, at optimum listening level, turning the dial to a given volume setting should optimise the output level of a system for a room of given size, hence volume.